Welcome to the Doddlers Club. We are a group of dog lovers with a difference! We never lose our leads. We never have the struggle of clipping the lead on our dogs when they are excited about going walkies. And we never have the bother of clipping the lead on and off when we’re out and about. The reason is, of course, that with a Doddle, the lead is always on the dog! The first time people see a Doddle in action they are amazed, “What a great idea!” “It’s so simple!” are typical comments. And most people just can’t wait to get their hands on one. Doddle for Dogs can make such a difference to everyone’s joy of dog walking that we want to spread the word far and wide. Most dog owners are happy to tell their friends but we thought it was only fair to say “Thank you” to all our customers who want others to enjoy the benefits of ‘walkies’ with a Doddle. So, as a member of the Doddlers Club, we’re offering special rewards for any new customers you introduce. Along with every Doddle purchased, you will find 2 ‘Doddlers Club’ cards. Simply write YOUR email address on the card and hand them out to other dog lovers or just email all your friends to tell them about the Doddle. For at least 2 customers you introduce you will be rewarded. When they purchase online, they enter your email address in the “Order Notes” Box on their order. 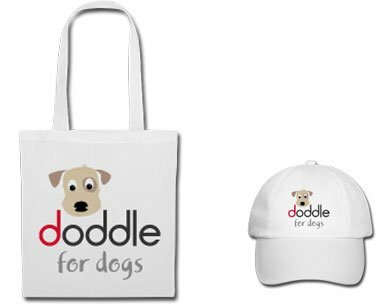 For 2 successful sales your reward will be a Doddle for Dogs Tote Bag. For 10 successful sales your reward will be both!! It’s well known that the most successful form of advertising is recommendation. (Which is handy because we don’t have oodles of cash to spend on promoting the Doddle.) Some of our initial manufacturing costs have been funded by Kickstarter, but now we are relying on the enthusiasm of Doddle users to keep the ball rolling. Thanks for all your support and remember that the more people you tell, the more people will discover the benefits. Happy Doddling!